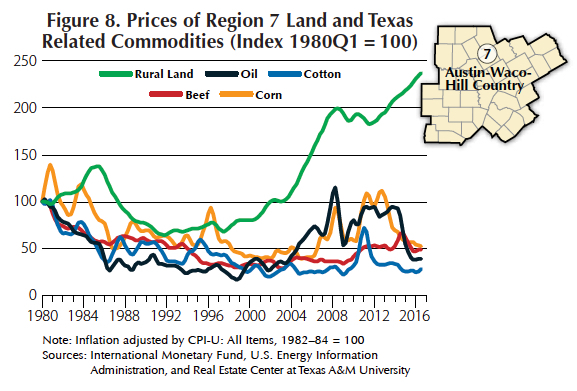 This is the second article of two focusing on Texas commodities (most notably oil, cotton, cattle, and corn) and how the prices of those products affect land prices. 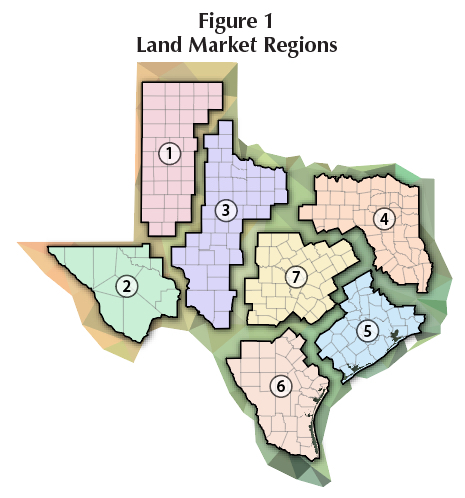 Real Estate Center researchers found that land price response to commodity prices differed between regions depending on whether oil, cotton, cattle, and corn were produced and how much acreage was devoted to each in the state's seven rural land market areas. 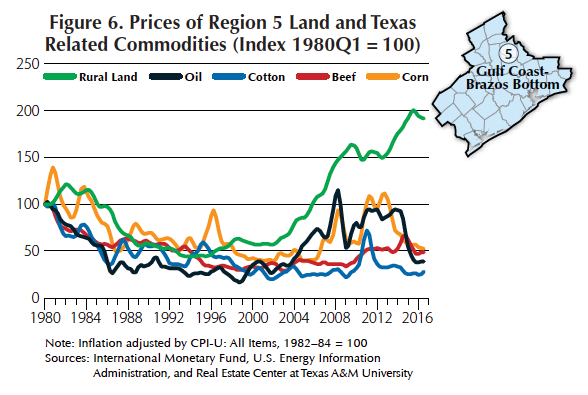 To determine if commodity prices have a significant impact on land prices, Real Estate Center researchers tested the validity of several commonly held perceptions. Are commodity price fluctuations and their impact on land prices proportionate to the production (quantity) of a commodity in a region? 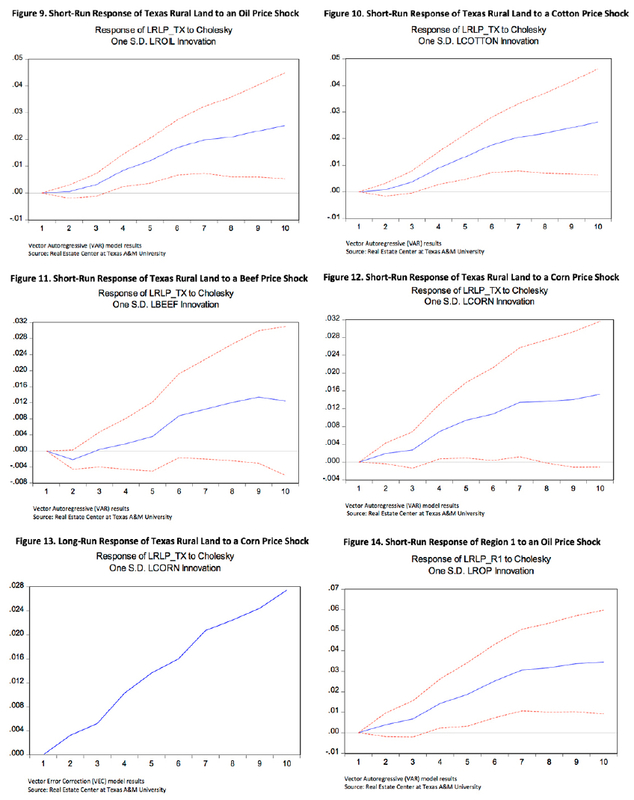 Do the types of commodities produced lead to different land price effects between rural land regions? 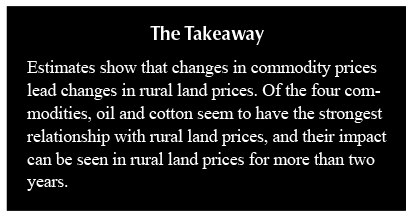 As commodity prices increase, is a commensurate positive impact felt in land prices? Will both short-term and long-term relationships between commodity prices and land prices emerge? Will divergence occur in the short-run from supply and demand factors but not be sustained over the long-run? Do Comm​​odity Prices Always Lead Land Price Changes? At the state level, all four commodities exhibited significant leading indicator characteristics with respect to rural land prices (Table 1). The results imply that a change in the price of oil leads a change in the price of land by three months (one quarter), while a price change in cotton leads by 15 months (five quarters). 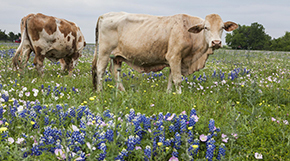 A change in the price of beef leads by nine months (three quarters), and corn leads by six months (two quarters). 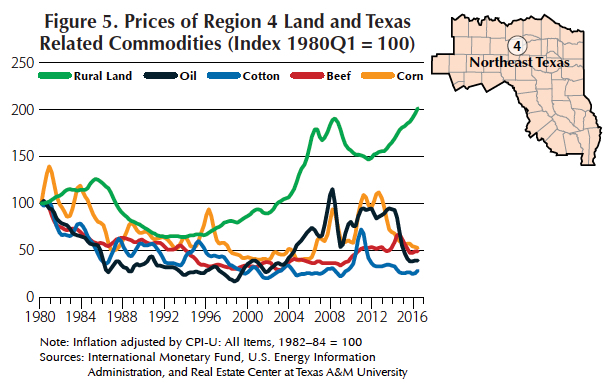 The analysis shows that Texas rural land prices have a time-delayed response spread over different time periods, and the effects of each commodity are different. They also demonstrated a positive relationship between them collectively, meaning an increase in commodity prices generally leads to an increase in rural land prices. Overall, the four commodity prices demonstrated a statistically significant leading indicator relationship with land prices for the seven rural land regions (Table 1). The length of the lead varies between regions and commodities. 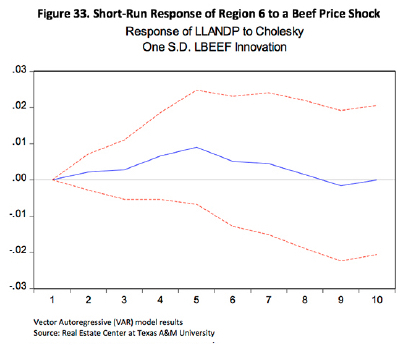 In region one, all four commodities exhibited a significant lead compared with region seven, where only beef and corn price changes were found to be statistically significant (Table 1). A commodity leads a change in the price of rural land by a minimum of three months to a maximum of 33 months. 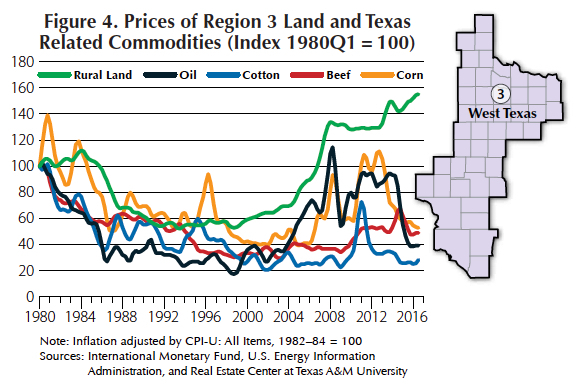 While the four commodities exhibited different lead times when compared to one another, the three historical Texas commodities—oil, cotton, and beef—exhibited stronger statistical leading relationships than corn (Table 1). In regions where commodities were nonexistent or minimal, no significant leading indicator status was observed. 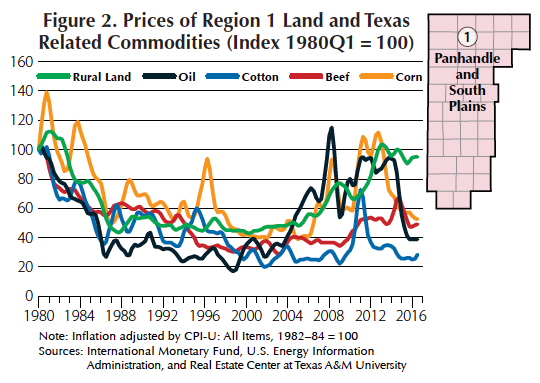 The consistent significant results obtained from the estimates show commodity prices, especially oil and cotton, do have a significant direct short-run impact on Texas rural land prices for the 30-year sample period (Table 2). Not surprisingly, region seven had no short-run relationship because virtually none of the four commodities were produced in that region (Table 2). 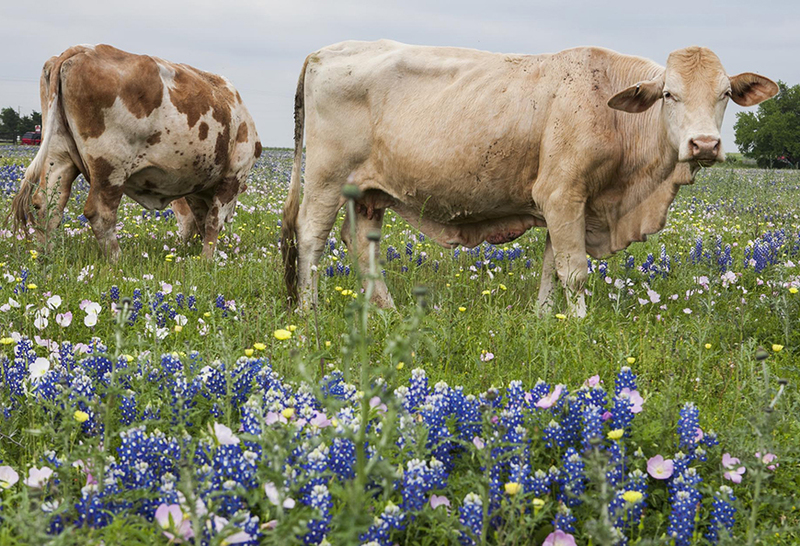 No short-run relationship was exhibited between corn and any of the rural regions compared with the three commodity pillars of the Texas economy—oil, cattle, and cotton (Table 2). Changes in cotton prices seemed to exhibit a short-run relationship in six of the seven regions followed by oil with five out of seven, and beef with one out of seven regions (Table 2). 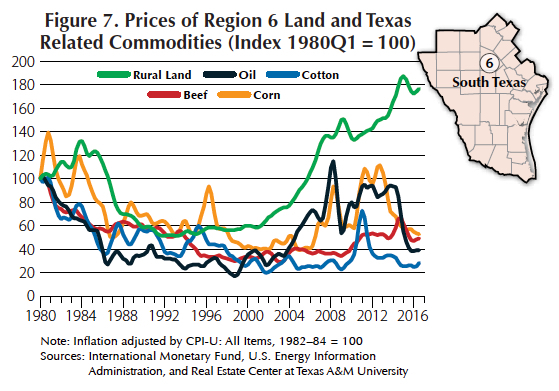 The long-run estimates showed consistent significant results revealing a long-run relationship between oil and cotton in four out of seven rural land regions (Table 2), demonstrating the strong ties between these two commodities and rural land prices for the past 30 years. 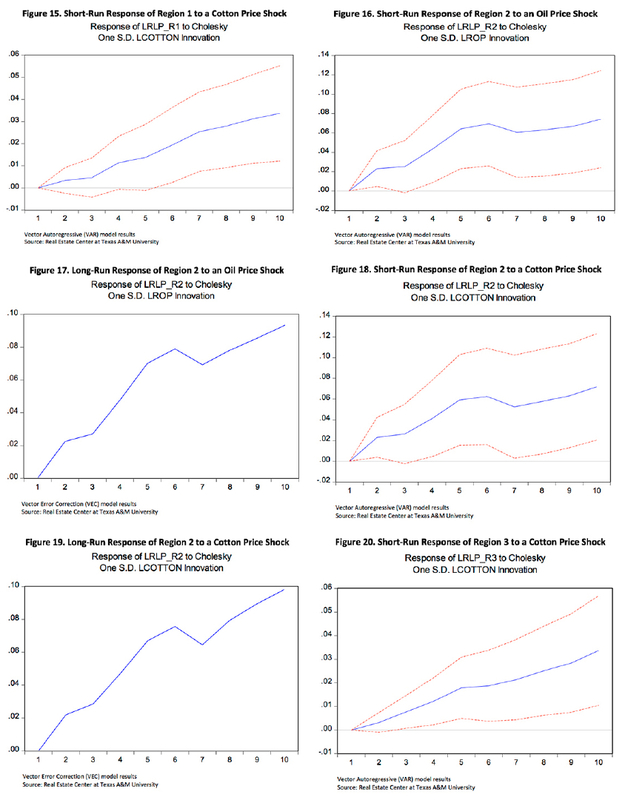 Unexpectedly, only a long-run relationship at the state level was found with corn prices (Table 2), meaning that by region there is no significant relationship, but an aggregate long-run relationship exists between rural land prices and corn prices. 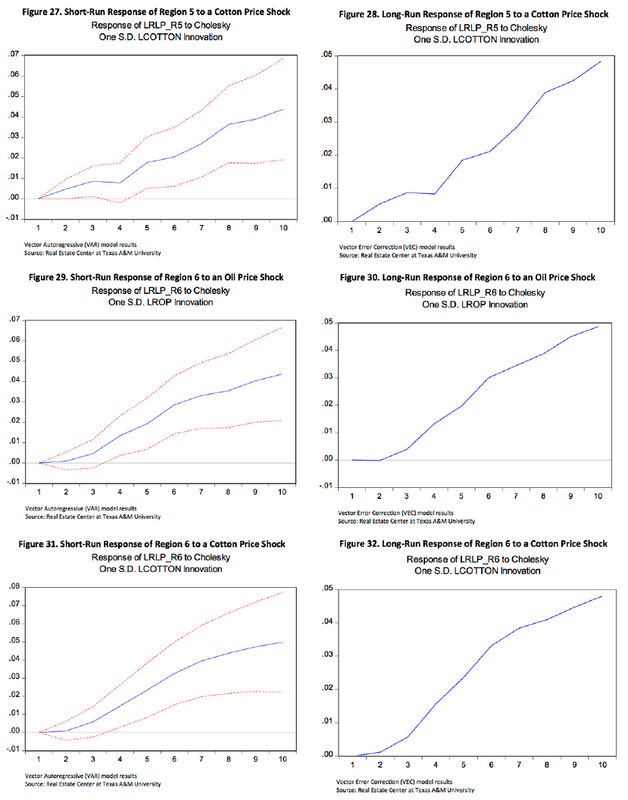 Based on these findings, Center researchers proceeded to evaluate how an unpredictable change (shock) in the price of the four commodities affects rural land prices in the short- and long-run. The analysis was done only for the regions where a significant relationship was found. 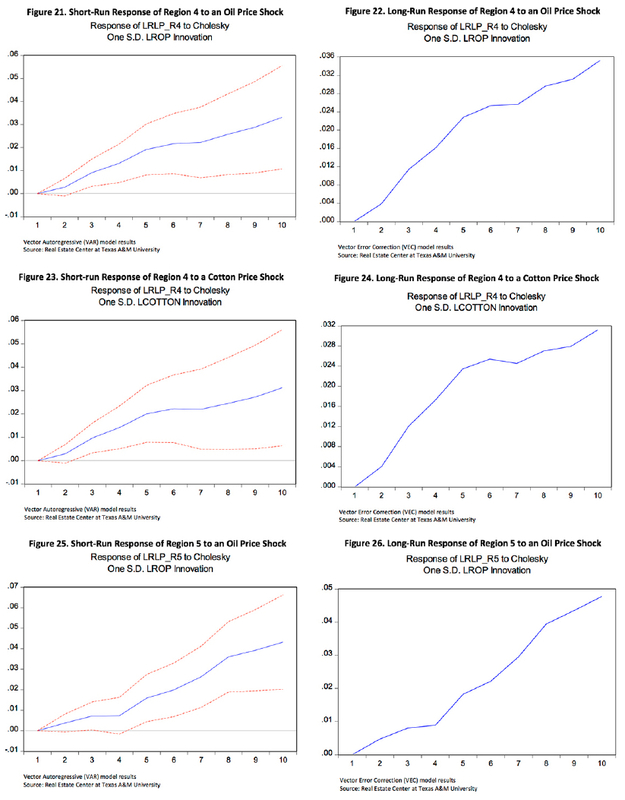 This analysis reveals the isolated way an unexpected movement (shock) in the real price of commodities affects real rural land prices over time. As the figures show, the response of land prices in the full sample to a positive change in the price of the commodities is statistically positive (Figures 9–33), meaning a positive unexpected change in the price of one of these commodities leads to a positive change in rural land prices. The inverse is true if commodity prices fall; that is, it would cause a negative change in rural land prices. The results mean that the effects of the commodity price changes are felt through time in the price of rural land. 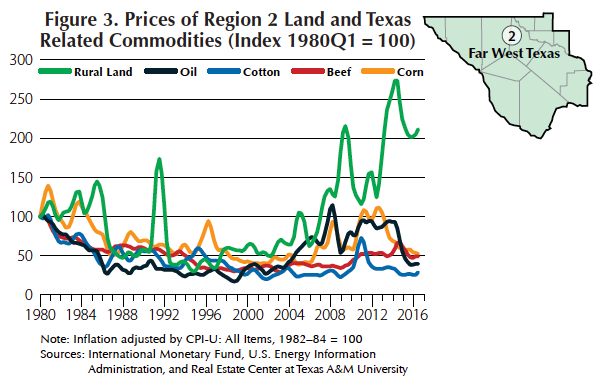 ​For more information, see Center publication number 2151, "Oil, Cattle, Cotton: Commodities Affect Land Prices​."